Cook for 4-6 hours, DO NOT STIR! Cook 1 c of quinoa according to package directions and heat 1 can of black beans with liquid on stove top. Carefully remove chile Colorado from slow cooker, it will be fork tender. 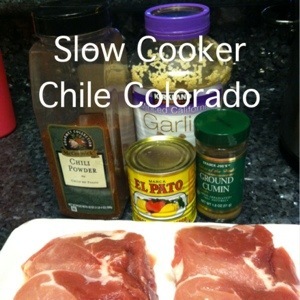 I serve it with quinoa and black beans, instead traditional rice and refried beans, also I substitute pork loin chops instead of beef for a cheaper and healthier meal.This slow cooker chile Colorado recipe is outstanding and extremely easy to prepare. Give it a try, you won’t be disappointed! For more slow cooker ideas and recipes follow my pinterest board A Working Woman’s Savior the Slow Cooker. How do you incorporate quinoa into your diet? I would love some new ideas, please share! This recipe sounds great! I just bought a new slow cooker last weekend so I want to use it this weekend and I just might have to try this recipe. Do you think I could substitute chicken? If I try it out I will let you know how it is! Thank you! You are going to LOVE your slow cooker! For sure you could substitute chicken. I often throw in whatever I have in the freezer, my only advice is put in boneless meat :-) Let me know how it turns out!